In the liner notes they call it a cante-fable – a combination of song and story-telling. “Peter Kagan and The Wind” by Gordon Bok is one of the most strange and beautiful recordings I have ever heard. It is a myth about a fisherman who marries a seal. He is caught at sea by the cold North Wind. The Wind says: Listen, I got something to tell you. Kagan, rowing: I don’t want to hear it. Gordon Bok worked among the fishermen off the toast of Maine, he is a poet and plays one of the most singing ringing acoustic guitars on record. Kagan is freezing dying until . . . . . . he dreams his wife comes down the smoking sea and she climbs into the dory with him . . . . .
Gordon Bok, “Peter Kagan and the Wind,” Machigonnne Music (BMI) (1971). 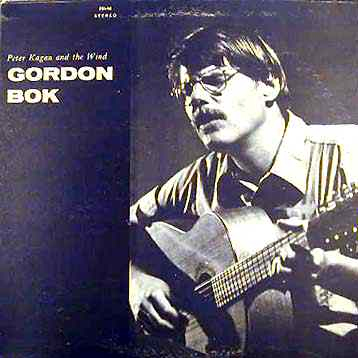 From Gordon Bok, Peter Kagan and the Wind, Folk Legacy Records, FSI-44 (1971). Album design – not credited.